Cymbals has finally landed… and brought a 2nd saucer with it! Originally recorded for the Impulse! jazz label in ’73, Cymbals is paired with a 2nd disc of unheard material from the same sessions. Hear Ra’s Baroque soundscapes, electrolytic clusters and dithering Moogs catalyze images of monoliths, space stations, computers malfunctioning and galaxies imploding on two compact saucers, with liner notes by known Ra-fficianado Brother Cleve! Making its debut here, the 2nd disc is culled from a mysterious tape recorded during the same time frame and with many of the same musicians (though no Ronnie Boykins; Ra provides keyboard bass). Could this be one of the unissued Impulse! LPs? Quite probable. The tape box only lists the song titles. 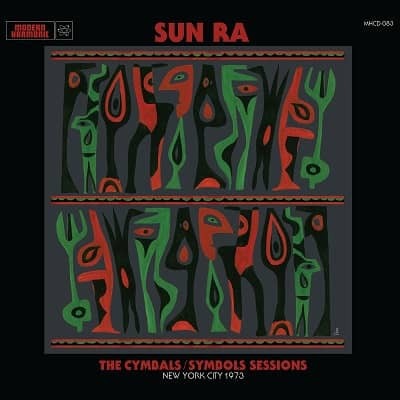 The 2nd disc opens with some "Space Age Cocktail Music" as only Sun Ra could conjure in his intergalactic lounge. Continuing the Sci-Fi film references, the first four tracks could well be post-last call cantina music from a galaxy far, far away. 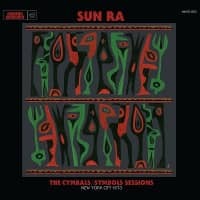 The final two tracks, comprising Ra’s keyboards and accompanying drums/percussion, feels like an alternate soundtrack to 2001: A Space Odyssey, a film still playing in theaters in 1973. 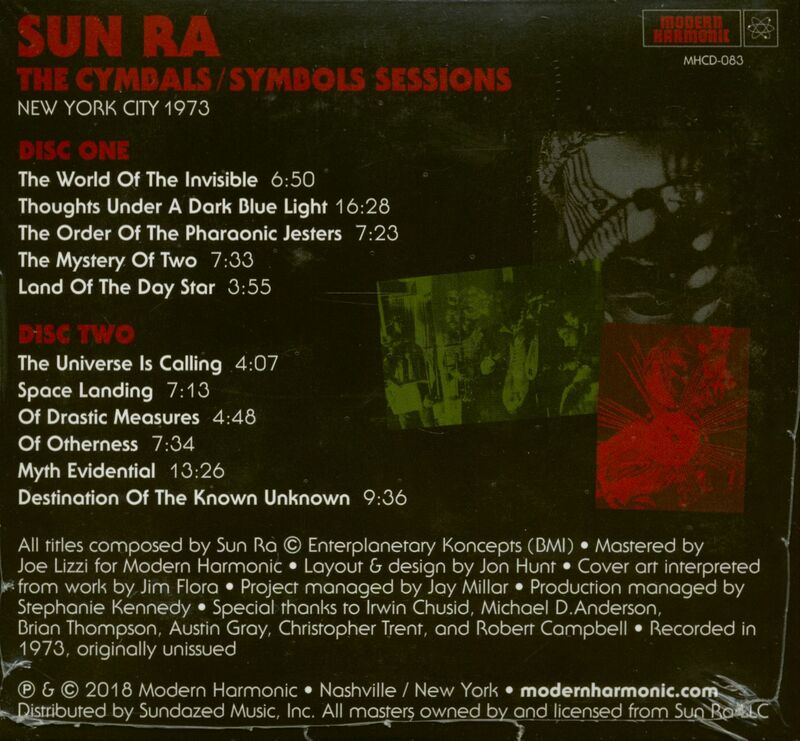 The Cymbals / Symbols Sessions New York City 1973 is yet another piece of the puzzle, the Mr. Re of Mr. Ra. On two compact saucers with liner notes by known Ra-fficianado Brother Cleve! Sun Ra was an American experimental and avant-garde jazz composer and musician (piano, organ, keyboard), poet and philosopher. He was born on 22 May 1914 as Herman'Sonny' Blount in Birmingham, Alabama and died on 30 May 1993 in his birthplace. Sun Ra was already considered a myth during his lifetime and until today as one of the most wicked jazz musicians of this world (or the Orbit?). With his very own style and innovative ideas, he polarized the critics and the audience. For some he was a brilliant innovator, for others a charlatan. However, it is undisputed that Sun Ra is one of the pioneers of free jazz. His bizarre astrological sermons and philosophies made him as famous as his musical compositions and performances. 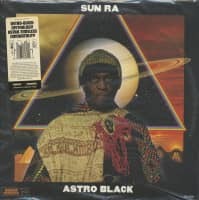 In 1952 he gave up his birth name and took the name Sun Ra (Ra is the name of the ancient Egyptian sun god) and conducted an orchestra with a constantly changing line-up, the famous Arkestra. The most notable members of the Arkestra were the saxophonists John Gilmore, who in turn strongly influenced John Coltrane, and Marshall Allen, who still leads the Arkestra today. 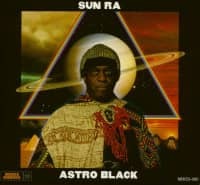 The word Arkestra was developed by Sun Ra as a connection from ark to orchestra. In the 1950s, Sun Ras first developed music from swing, with which he began his career in the 1940s,'reinventing' himself by using the science fiction hype, devoting himself to space issues and giving his new sounds the label'Cosmic Jazz'. According to music critics and jazz historians, some of his best works were created during this period. 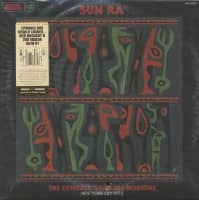 Notable Sun-Ra albums of the 1950s include many Super-Sonic Jazz, Sun Ra Visits Planet Earth, Interstellar Low Ways, Angels And Demons At Play, We Travel The Spaceways and Jazz in Silhouette. As early as the 1950s, the eccentric began wearing strange costumes and headdress in Egyptian style. He claimed he came from the planet Saturn and developed an artificial figure of lyrical poetry and'cosmic' philosophies preaching peace and consciousness. Unlike many black musicians of his generation, he rarely talked about controversial topics. He preferred to make music while the ensemble of musicians who worked with him and toured with him was constantly changing. In the 1960s, Sun Ras music became increasingly experimental with a tendency towards chaos. During this period his popularity reached its peak when Beat Generation and Psychedelic Rock discovered Sun Ra for themselves. During the 1970s and beyond, the music of Sun Ra and the Arkestra developed in conventional directions, but still highly eclectic and energetic. With the singer June Tyson he brought jazz standards to the stage in a captivating way and began to process parts of Walt Disney's music from the Disney films. In the late 1980s, the Arkestra even gave a concert in Disney World. 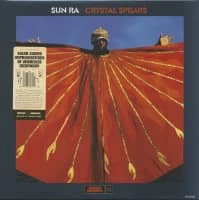 Sun Ra has recorded over 100 albums from 1956 to 1993. Some were released on his own label El Saturn and many others under the name Sun Ra & His Arkestra and numerous variations of them (Sun Ra & His Solar Arkestra, Sun Ra & His Myth Science Arkestra, etc.). 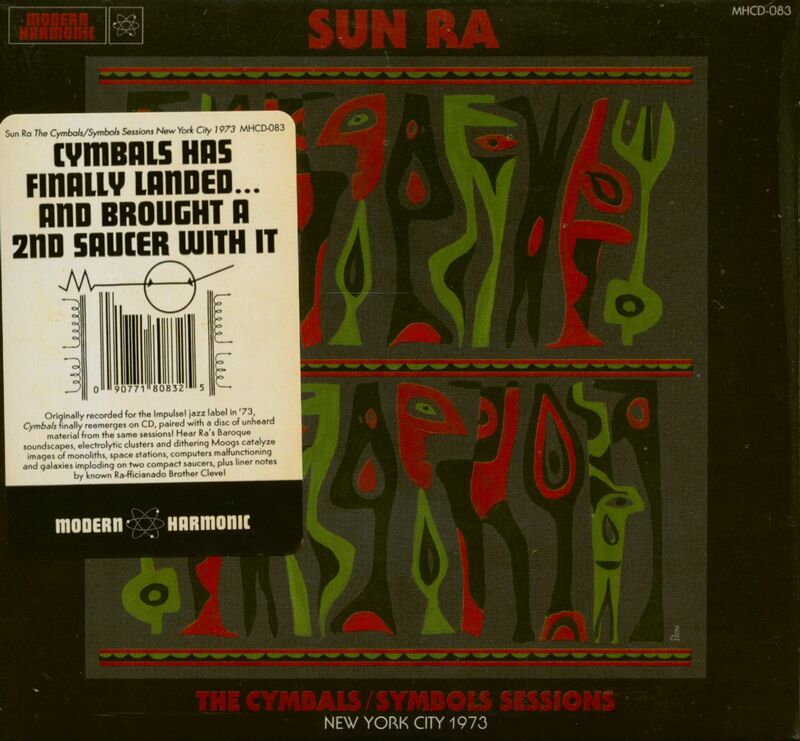 Customer evaluation for "The Cymbals - Symbols Sessions - New York City 1973 (2-CD)"